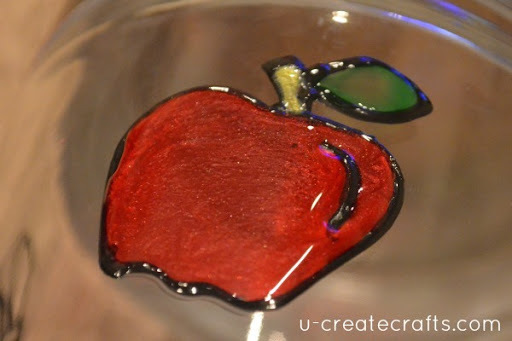 So I found this awesome glass paint at the craft store called GLASS STAIN…it is so cool you guys. 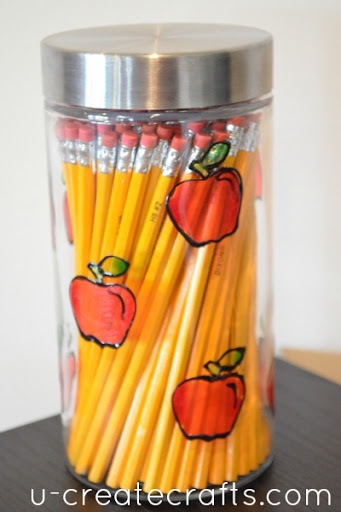 I made this faux stain glass pencil jar for a back-to-school teacher gift. Seriously, you guys, this glass stain stuff transforms glass into a work of art. Although the drying time is longer than ordinary paint, it’s permanent if used according to directions. You are going to love this stuff! There are so many possibilities. First, randomly put on the vinyl stencils. Trace just inside the stencil with the BLACK LEADING GLASS STAIN. 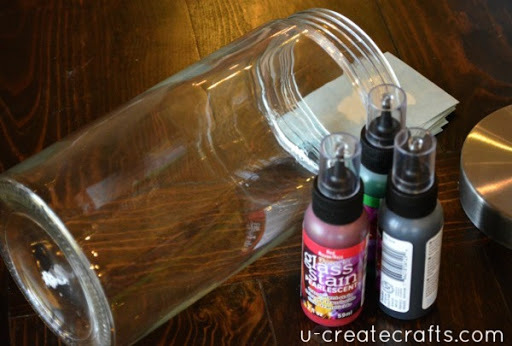 This stuff provides the outline you will put the Glass Stain in. It keeps the Glass Stain from running all over the glass. 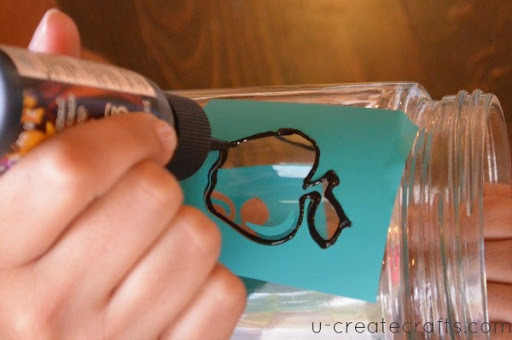 Remove the stencils while the Black Leading is still wet. Let it try for an hour or so. 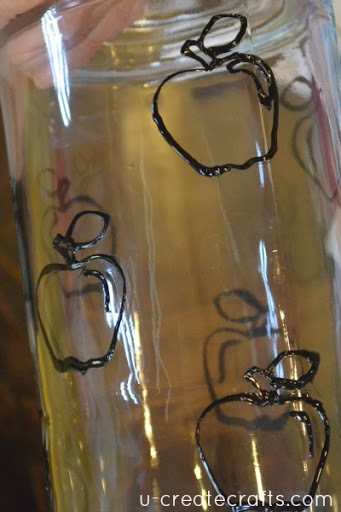 It won’t drip so you can do all the apples and set the jar aside. Be careful not to smudge the other apples. It’s not fun to try to fix them. This next part is just like coloring! Fill in the outlined apple. I put a dime sized amount of red in the middle and rubbed it around with the tip of the bottle. This stuff WILL DRIP, so you have to lay it flat until it is dry which also takes a couple of hours. YOU CANNOT WORK ON THE NEXT APPLE UNTIL THE LAST ONE IS DRY! I know it seems like it took a while to make this project, but it was really easy and the end result is adorable! I loved making this “stain glass” pencil jar. It’s fun to try new art mediums! I now have so many other projects I want to tackle with this paint. My daughter has a plain white glass piggy bank that I plan to adorn soon. You could personalize so many things with this product! I love this! 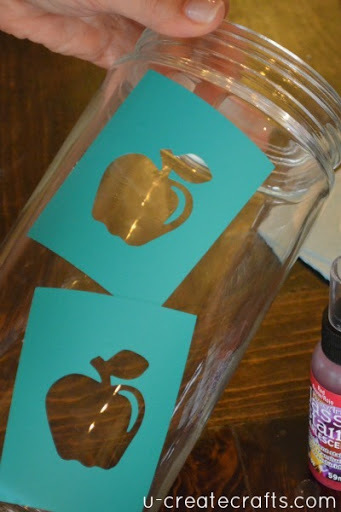 Did your kit come with the apple stencil (mine did not, but I wish it had)? No, I made a vinyl stencil with my craft cutter. This is adorable! My mom is a teacher, I think I will do this for her 🙂 Thanks for the great idea! I love this.. its lovely.. its something we can do together…! oh neat! 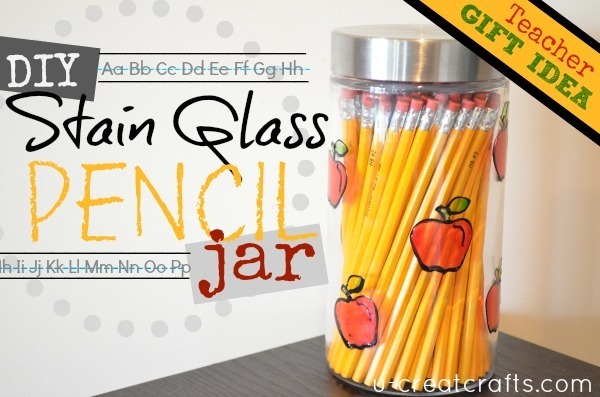 i could see myself doing this and repurposing a bunch of jars! Very nice, thanks! I am wondering how durable the glass paint is (can the item be washed)? really nice. 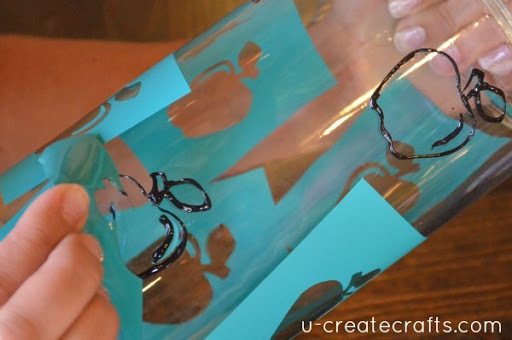 you know what also works well, put a stencil or image inside the glass and fill with rice. this keeps the image in place. then trace around the image on the outside, then you don’t have to mess around with the stencil interferring with your outliner.